"The way a pie crust should be made." Whisk flour and salt together in a large bowl. Cut in the lard with a knife or pastry blender until the mixture resembles coarse crumbs. Sprinkle in water, 1 tablespoon at a time, blending gently with a fork or pastry blender until all flour is moistened and dough almost cleans the sides of the bowl. Divide the dough in half and shape flattened rounds. Wrap in plastic and refrigerate for at least 1 hour. 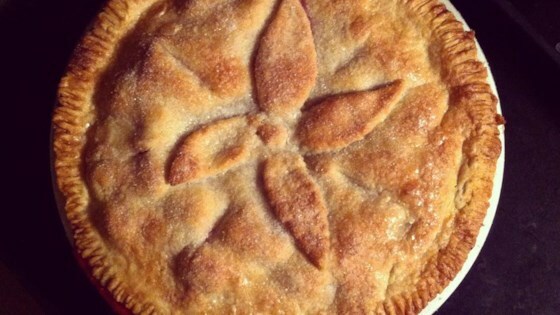 This from-scratch pie crust is easy and foolproof. Excellent recipe for those who are allergic to dairy. Easy to make and comes out flaky and nice. This is a basic recipe since time began. If you can't make this come out great then you better stick to the store bought. No changes, and I will definitely make it again! I'm so glad to find this recipe. It is the recipe that I have used for years, but lost. Heavy on the lard, yes, but we don't eat pie often enough to matter.